After many wonderful years spent on an industrial area on the Maag Areal in Zurich, in 2016 K3 moved to a new home at Breitensteinstrasse 49, a former car repair garage and changed its name into - K3 Project Space office led by Clare Goodwin and Sandi Paucic. K3 continues to function as an off site office for curatorial and artist led projects. 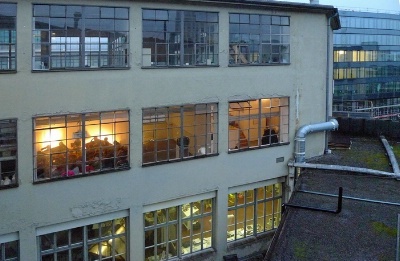 K3 Project Space was an artist led studio and project space, located originally in the old Maag gear factory in the thriving west area of Zürich, Switzerland. There were approximately 120sqm of space in a former factory production hall. The space offered the possibility for diversity, presentation, research and production of contemporary art. K3 project space has organized around 90 exhibitions and countless performances, discussions, concerts and many artist partys. Since 2002 K3 has programmed a wide variety of activities including exhibitions, performances, lectures, screenings, informal meetings and other events. With our initiative we focus on contemporary art in the broadest sense. K3 aims to encourage the discussion of contemporary art practice, providing exhibition opportunities for established and unknown artists. It also aims to establish direct relations with contemporary art practice from Switzerland and Great Britain, whilst bridging the gap with international artists.